For many people, Pensacola, Florida is a place synonymous with naval aviation. And it’s no wonder. Pensacola, located at the tip of the Florida panhandle on the Gulf of Mexico is widely considered “The Cradle of Naval Aviation” as it is where Naval Air Station (NAS) Pensacola is located. While the Naval Air Station, commissioned in 1914, was the first Naval Air Station commissioned by the United States Navy, the base’s history actually dates back to the 16th century when the Spanish explorer Don Tristan de Luna raised a fort there. Today, NAS Pensacola is one of the most important bases in the world and has approximately 14,500 military personnel. The metropolitan Pensacola area has more than 400,000 residents and is a vibrant area to live and work. Pensacola is also a popular vacation spot due to its proximity to beaches, historical sites, restaurants, museums, clubs and great shopping. 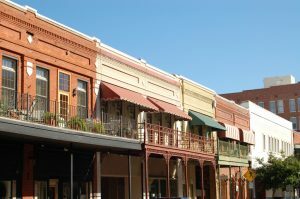 Whether you are in Pensacola on military duty or for some well-deserved R&R, you will find plenty of things to do and see in the area. Below are just a few places and activities you might want to check out. Best of all – most are free! Go on board the Pensacola Naval Air Station for a fun-filled day exploring the world’s largest naval aviation museum. There are more than 4,000 artifacts, over 150 restored aircraft, exciting Flight Simulators, the thrilling Blue Angels 4D Experience, information-packed tours, and much more. Go back in time with a visit to Historic Pensacola Village. One ticket is good for seven days and gives you access to four museums, tours and more. Explore 8 ½ acres and 11 properties open to the public including the T.T. Wentworth, Jr. Museum, Pensacola Children’s Museum, the Museum of Commerce, Old Christ Church, and Fountain Park. See examples of a range of architectural styles as well as Colonial, Victorian and World War II furnishings and artifacts. You’ll also learn about the past from living history interpreters. If you love music, you won’t want to miss Bands on the Beach, Pensacola Beach’s outdoor concert series. Bring a chair to the Gulfside Pavilion every Tuesday night at 7 from April through October and enjoy music from regional artists. Check here for the schedule of performers. Pensacola Beach is a beautiful place to look at stars and planets. The Escambia Amateur Astronomers’ Association sets up free telescopes and offers free stargazing to the public at the Gulfside Pavilion and Ft. Picken’s Battery Park on select Friday and Saturday nights through October. Click here for this year’s stargazing dates and times. The world-famous Blue Angels are based at NAS Pensacola and it’s a real treat to watch them practice. Outside of the National Naval Aviation Museum, you can watch the Blue Angels practice every Tuesday and Wednesday from March to November at approximately 11 a.m. Be amazed at the incredible death-defying aerial displays performed by the U.S. Navy’s flight demonstration squadron, including the renowned diamond formation. If you’re visiting on a Wednesday, be sure to stick around the museum for a meet and greet with the pilots – get great photos and autographs! No visit to Pensacola would be complete without a visit to one of the area’s beautiful beaches. Pensacola Beach is on a barrier island, Santa Rosa Island. The beach is a frequent award-winner for its pristine sugar-white sands, clear waters, and unspoiled natural surroundings. Take the free beach trolley service to get around the island. You can also learn about local plant and animal life on the Sand Eco Trail. Learn more about Pensacola Beach here.